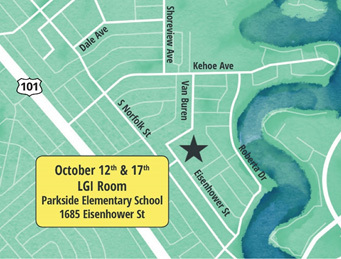 The City of San Mateo’s Clean Water Program will hold two informational meetings about upcoming assessments of the sewer system in the Marina Lagoon and the southern portion of the Shoreview Parkside neighborhoods (see map area). The meetings will be on October 12 and October 17 from 6:30-8:30 p.m. at Parkside Elementary School. The assessment work is planned for November 2017 through March 2018, and will include a variety of inspections and tests to determine how best to fix aging or damaged lines. For some of these assessments, the City must obtain homeowners’ permission for workers to enter the property. 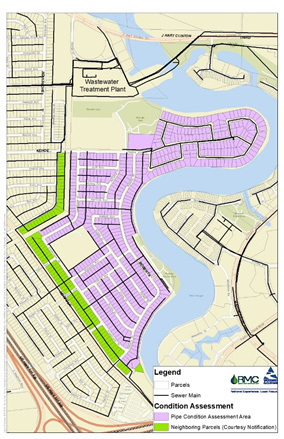 At the neighborhood meetings, residents will be able to determine the specific activities that may be planned for their property, and if a Right-of-Entry form is required. Residents will also have the opportunity to fill out Right-of-Entry forms at the neighborhood meetings. These meetings will provide details about the locations and types of work that will be focused on sewer lines, sewer manholes, and storm drain lines. General information about the Clean Water Program will also be presented. The Clean Water Program's goals include upgrading and repairing the City’s aging sewer collection and treatment system. These assessments are a vital part of the program. As part of this program, several sewer projects are planned to improve service and comply with regulatory requirements to protect public health and the environment for years to come. Meetings will start promptly at 6:30 p.m. with a formal presentation and time for questions, followed by an open house with information stations. The same material will be covered at each meeting; there is no need to attend both. Additional information is available at www.CleanWaterProgramSanMateo.org. 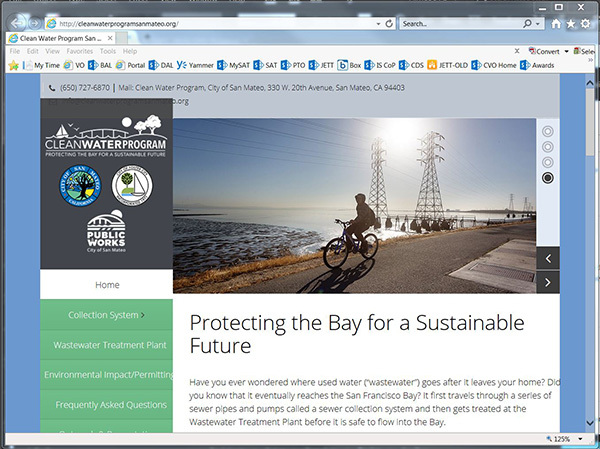 If you have questions about the upcoming meetings or the planned testing, please call 650.727.6870 or email Info@CleanWaterProgramSanMateo.org. On October 16, 2017, the City Council will hold a study session with the Clean Water Program (CWP) on program goals, funding options, sewer rates, and rate structure for future years. San Mateo is under a Regional Water Quality Control Board Cease and Desist Order and National Pollutant Discharge Elimination System permit requiring improvements to its sewer collection system and the Wastewater Treatment Plant to prevent sewer overflows and discharges of untreated or partially treated wastewater. The CWP is intended to address the required improvements, and is estimated to cost approximately $900 million through fiscal year 2025/2026, in addition to the ongoing annual capital improvement projects and operating and maintenance costs. Funding this unprecedented investment in the City’s sewer collection and treatment system will require financing, as well as additional revenue increases. The City Council (Council) approved a rate increase for the fiscal year 2017/18, but this rate increase is not sufficient to fund the entire program. Changes in the rate structure to include part-fixed and part-use-based fees and multi- year rate increases are proposed options to produce sufficient revenue. During the study session, CWP staff will present financing options aimed at balancing rates and ensuring timely delivery of CWP projects, while also providing the City with flexibility to optimize its financial strategy. CWP staff will also discuss the likelihood of financing availability, funding strategies, and inherent risks. Input received from the Council at the study session will be used to refine and guide the development of a detailed financing plan and specific proposals for the sewer rate setting process for the coming fiscal years. The public will have opportunities to provide input to the proposed rate structures and estimated rate increases during community meetings planned for November 2017. The proposed rates will be presented to Council in early 2018. The redesigned site contains all the information provided in the original layout, but has been updated to be more user friendly and easier to navigate. We welcome your feedback and comments on how to continue to improve the website.